Use our resources to learn more about stone quarries, or test yourself on your knowledge of Stonehenge with today’s 5-question Quick Quiz. Teachers, scroll down for a short list of key resources in our Teachers’ Toolkit, including today’s quick quiz and MapMaker Interactive map. 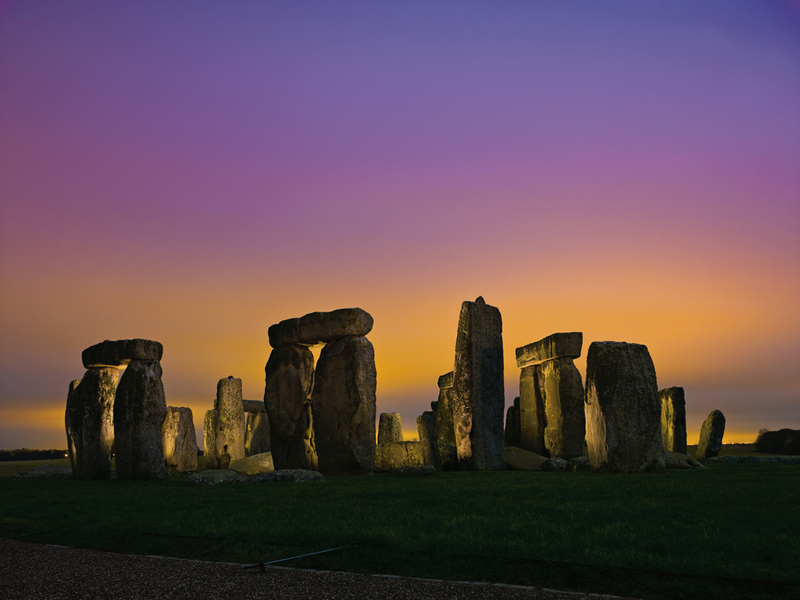 The large sandstone sarsens dominate this gorgeous image of Stonehenge at sunset. The new archaeological discovery at Stonehenge concerns the origins of the monument’s bluestones. What are bluestones? “Bluestone” is a generic term for many types of rocks, including igneous (basalt), sedimentary (limestone and sandstone), and metamorphic (slate). Bluestones are often used as building materials, and generally have a slate-blue tint. 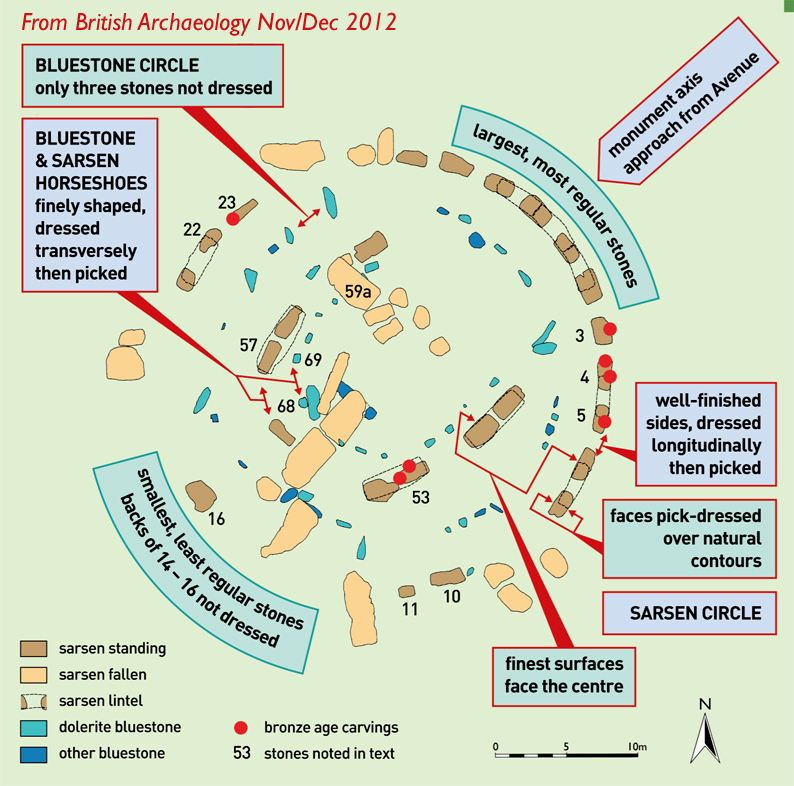 This lovely diagram of Stonehenge shows the central circular bluestone configuration in blue. At Stonehenge, “bluestone” is a generic term for all rocks that had to be transported to the site. For this reason, bluestones are also called “foreign” or “imported” stones. The most common bluestone at Stonehenge is spotted dolerite. Learn more about spotted dolerite, a type of basalt, here. The other major type of rock used at Stonehenge are the giant sandstone sarsens. 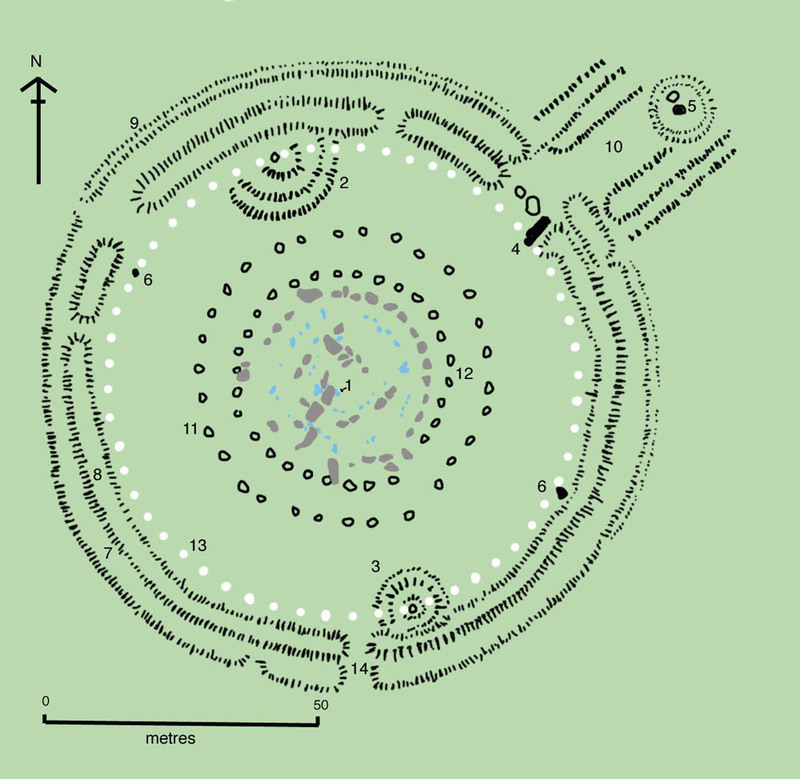 Take a look at this map from the good folks at British Archaeology for a terrific (literal) overview of the rocks at Stonehenge. Use today’s MapMaker Interactive map to see how Stonehenge’s bluestones went from Pembrokeshire Coast National Park, Wales, to Salisbury Plain, England. How did scientists determine that Stonehenge’s bluestones came from Welsh quarries at Pembrokeshire Coast National Park? Take a look at the second bookmark on today’s MapMaker Interactive map to see one of archaeology’s best guesses about how the bluestones got from Wales to Stonehenge. How did ancient miners quarry and transport the bluestones? Carbon dating of ashes and chestnuts (a popular Neolithic snack) at the Welsh quarries indicates the bluestones were extracted about 3400 BCE, but the bluestones didn’t get put up at Stonehenge until 2900 BCE. (FYI, the giant sarsens didn’t go up for another 500 years, in about 2500 BCE.) Did it really take ancient engineers 500 years to drag the stones 200 kilometers (125 miles)? Nat Geo: What is a quarry? Archaeology, geology, geography, engineering and a dash of mythology to kick off your Wednesday? A definite “Brain Popcorn”-type post from the folks at National Geographic!